In China, ethylene based PVC prices have been following a stable to firmer trend in the midst of soaring spot ethylene and VCM costs in Asia and limited availability. Plus, a lack of plentiful American cargos in the market contributed to the strong trend for import PVC prices to the country and supported the trend for ethylene based PVC. On the contrary, acetylene based PVC prices remained on a steady to softer path owing to generally slower demand ahead of the upcoming Chinese New Year holidays. 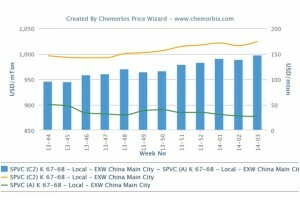 Currently, ethylene based PVC is carrying a large premium of around $150/ton over acetylene based PVC, according to ChemOrbis Prize Wizard. An ethylene based PVC producer in Ningbo issued CNY50/ton ($8/ton) hikes on their prices at the upper end of the overall price range given their tight supplies and high costs. “Overall demand is slow now, but we will not lower our offers over the near term and refused lower counter bids from buyers for the moment. We have no choice but to raise our prices due to our high costs and in order not to produce with losses,” a producer source mentioned. He added that buyers may gradually accept higher prices due to generally tight supplies. A trader who was offered increases by the producer highlighted, “High costs support higher PVC offers. Customers may have to pay them to purchase some volumes to sustain their normal production.” He also commented that acetylene based PVC prices posted small drops on a weekly basis while they sourced some volumes given their low stocks. Another ethylene based PVC maker also applied slight price hikes in line with other producers and their high costs. “We feel that ethylene based PVC prices will not see any declines and may even see small increases given high costs. We could achieve some sales at our recent offer levels,” a source at the producer reported. Meanwhile, acetylene based PVC producers complained about weak demand for their materials, saying that they struggle to sell large amounts. “We face some sales pressure these days as our customers limited their purchasing volumes a bit. We are not willing to cut our prices in the near term as we already issued CNY50/ton ($8/ton) drops last week,” a source at a producer noted. Another acetylene based producer maintained their prices given unsatisfactory buying interest from downstream markets. “We managed to sell small volumes with CNY30/ton ($5/ton) discounts. We feel prices may hover at current levels over the near term. We are producing normally now,” a producer source stated. A profile converter sourced some acetylene based PVC to meet their basic February requirements after seeing softer prices. “However, we will not purchase more as we are unwilling to build stocks given the uncertain post-holiday outlook,” the buyer commented. 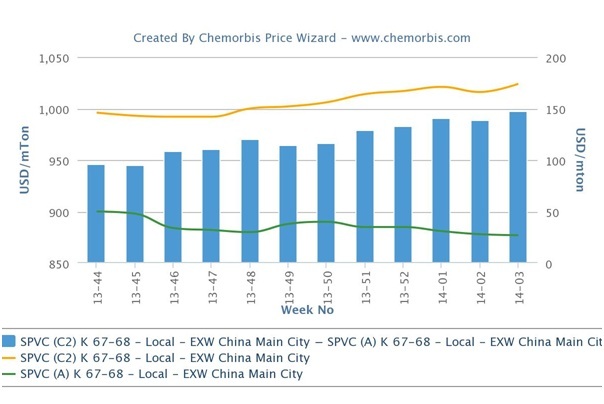 According to ChemOrbis, spot ethylene costs increased by around $40/ton on CFR Northeast Asia basis since January started. Spot VCM prices notionally rose by $10/ton with the same terms over the past week in line with reports that supply is considered to be limited for the feedstock.